I know a wee piggy who got into a terrific mess. This little piggy appears to be headed to the fair all shiny and clean, but in the excitement of the moment he wallows in brown becoming muddy and dirty. And from there he wallows in red to go with the brown, and he wallows in white to go with the red, and he wallows in pink to go with the white… and so on until he has wallowed in all the colors of the rainbow. Finally he heads for the dunking booth where he’s going to wallow in blue. Surprisingly, the water in the dunking booth does not clean up this little piggy, but he does end up winning the 1st place blue ribbon in the art show! This story is written in the style of ‘I Know an Old Lady Who Swallowed a Fly’. 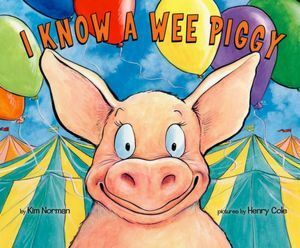 Kim Norman uses the familiar rhythm of the traditional verse of a silly old woman, and tells us an even sillier story of a fun-loving piggy who wallows in color and wins first prize in the art show. Henry Cole does a prize-winning job himself with the illustrations in this book. They start off simply with the wallowing in mud, after all that’s expected of a pig. But when this wee piggy starts wallowing in other colors as well, the hilarity mounts with each spread. Little ones will love investigating each new circumstance the piggy gets into, heck I did too! 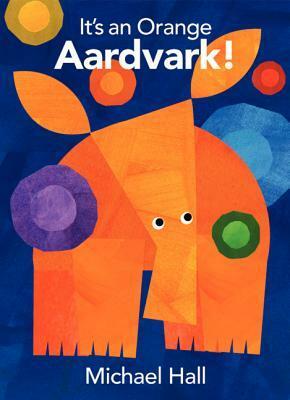 This is a definite must-have addition to any picture book collection. It is particularly good for a collection of color-naming books for preschoolers. The text and illustrations are funny and heartwarming. Readers may not be able to ‘sit-still’ for a reading of the story, but they will certainly be rooting for the wee little piggy as he races through the crowds and tents of the county fair.